I have just returned from 10 days spent in Beijing. One day the friend there I was staying with and I planned a trip to the Great Wall of China, and decided to make the journey to Shanhaiguan, 300km east of Beijing, where the wall meets the sea for a day trip. The information available online in English about this part of the wall is sketchy at best (this is the best there is), so hence I am writing this blog entry to help out other independent travellers making the trip in future. Data is correct as of June 2014. Our trip covered First Pass under Heaven, Laolongtou and Jiumenkou, each of which is covered in more depth below. You need to take a train from Beijing Railway Station (i.e. the old station, on Line 2 of the Subway) to Shanhaiguan station. The best connection is train D29, leaving Beijing at 0700 (schedule here). D25, leaving at 1002 and arriving 1240, is an alternative (schedule here). For the return go for D43/D46 departing Shanhaiguan at 1815 and arriving 2114 (schedule here), or D30 departing 1948 and arriving 2222 (schedule here). These services are normally operated by comfortable CRH5 trains. You need to book rail tickets in advance – you can book up to 18 days ahead, and ought to book at least 3 days ahead, in order to guarantee yourself a seat. Details of how to do this can be found here. Tickets should cost 92 Yuan (about €11) per person single. 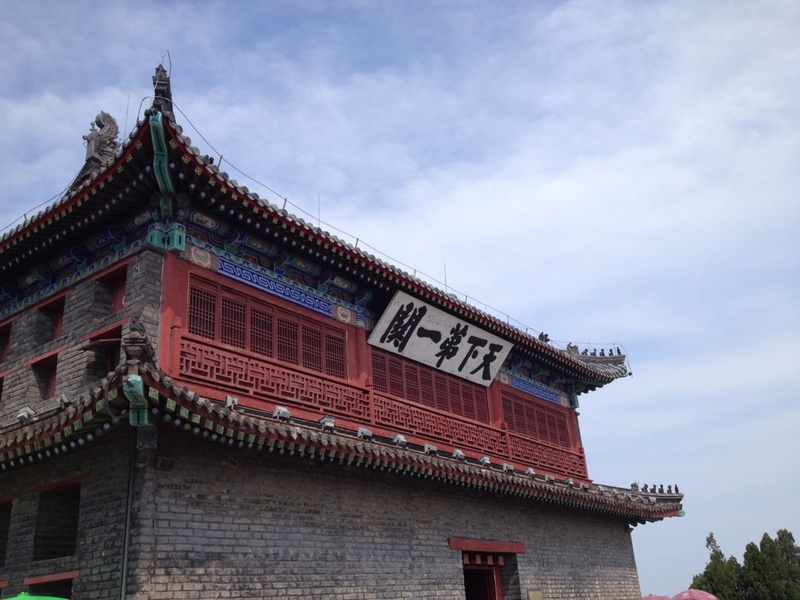 Note that Shanhaiguan is part of the city of Qinhuangdao, and there are more trains connecting Beijing with Qinhuangdao than to Shanhaiguan. If you take a train to Qinhuangdao you can expect a taxi ride of more than 30 minutes to get to Laolongtou or First Pass under Heaven. 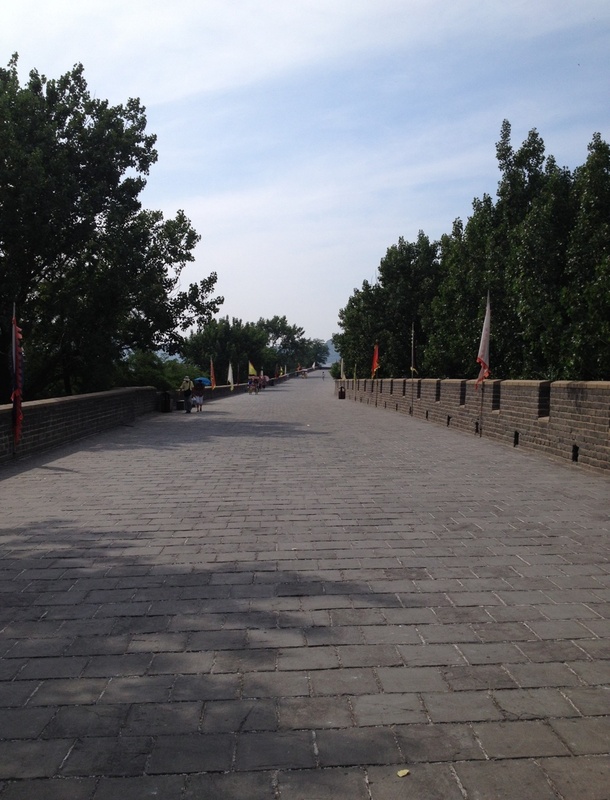 First Pass under Heaven is about 1km north of Shanhaiguan station, so can be reached on foot. 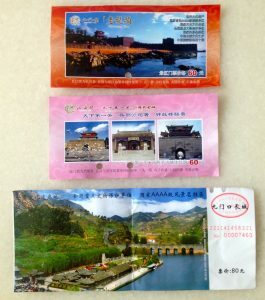 Laolongtou (5km south, about 15 Yuan) and Jiumenkou (15km north, about 40 Yuan) are easier to reach by taxi. Easiest is to have the Chinese on the screen of your phone and show this to the taxi driver. The Zedong Tower (pictured) is the main feature of this complex of towers and wide and well maintained walls. 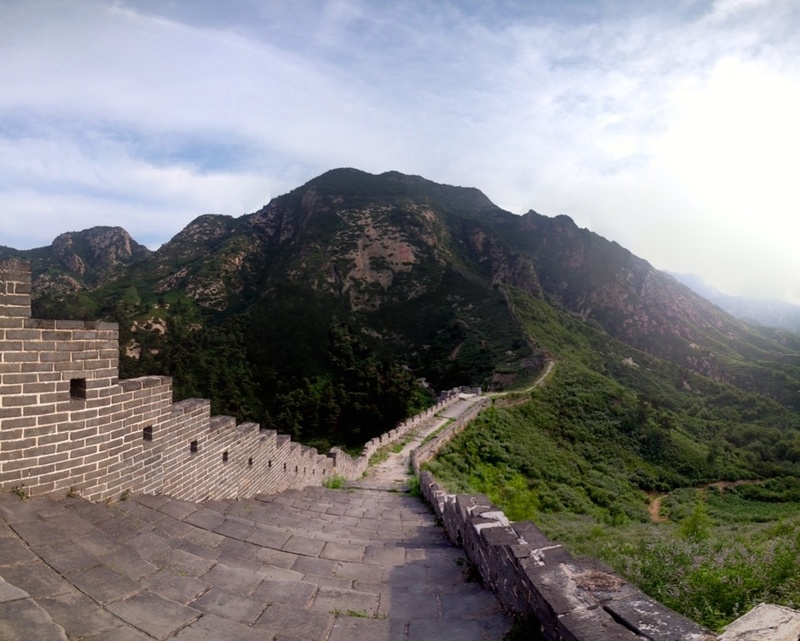 It takes about an hour to walk around between the 4 main towers here, and to walk north along a short section of wall (pictured) from which (smog permitting) you can see the wall climbing into the hills ahead. 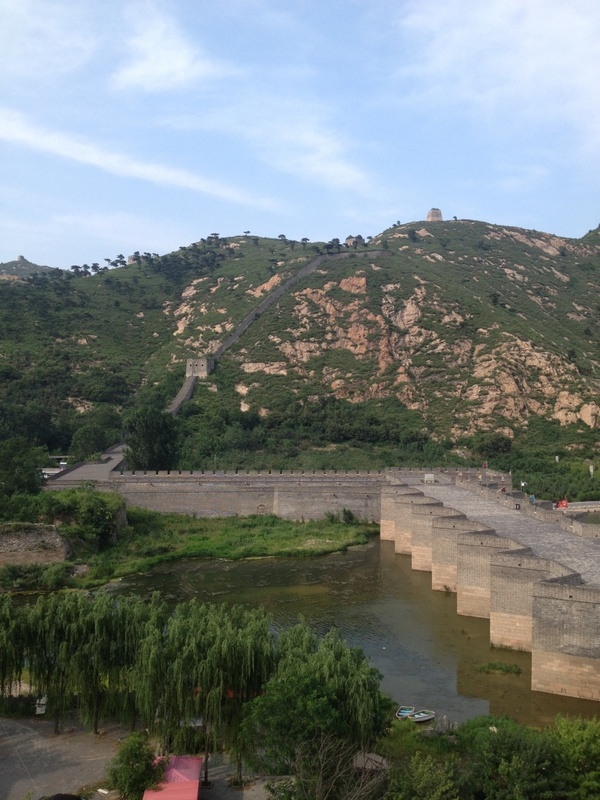 Just south of the First Pass is the Great Wall Museum – details here. Due to a lack of time we did not visit this. 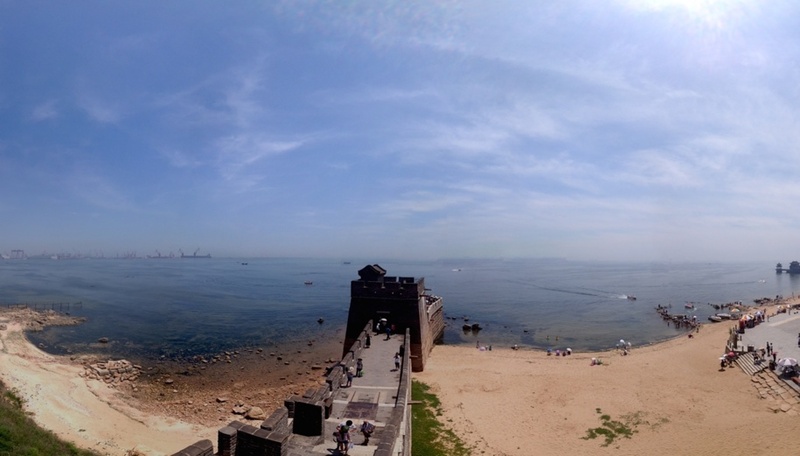 This is the point at which the Great Wall meets the sea. Largely destroyed in 1900, what stands here today is as a result of reconstruction work that started in the 1980s. 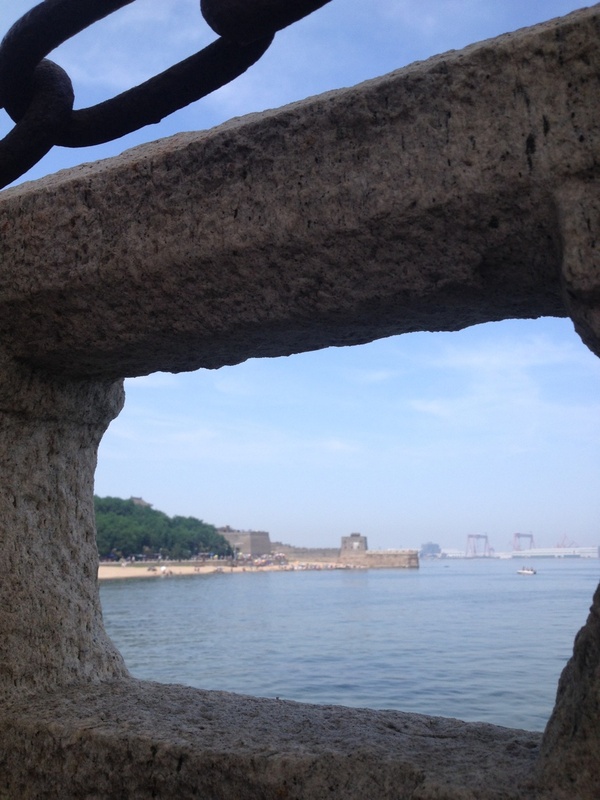 As well as the wall section that meets the sea and fortress behind this, there is a small Buddhist temple just along the cost that also affords good views of the wall (second picture above). This complex was rather busy and although well maintained in general the pathways were steep and poorly maintained in places – wear good shoes. The highlight of our trip. This part of the wall is in a deep valley, and features one of the few bridges along the wall’s length (normally if a river was wide enough it was assumed enemies would struggle to attack that way). It is possible to climb the wall for about 1km steeply uphill from the bridge, where is is well preserved and maintained, before then falling into disrepair on the higher sections. Note that even where the wall is well maintained, the steepness of the climb should not be underestimated! When we visited in late afternoon there were only a few dozen other visitors meaning in parts we had the place to ourselves. Are reservation fees and private railways killing the allure of Interrail? Brilliant, thank you Jon. Also much enjoyed your articles about the European train network, I suggest “London Underground” by the Amateur Transplants. Thank you so much for your writing. It is valuable for our group (10 people) to walk and take a bus to reach each points instead 0f rent 3 taxi whole day(expensive). We enjoyed and thanks again for your writing.